"Isn't forecasting just guessing? Why bother?" I get that question a lot. It’s a good question too, because it leads to a better understanding of how and why we use forecasting to help manage a business, and to predict starting costs and the numbers for the first few months of a startup. The key is that, of course, you guess. We’re people, we don’t know the future, so we are always guessing. But we’re not just guessing. We’re developing sets of assumptions. We’re looking at drivers for sales, realistic assumptions for expenses. We draw from experience as much as we can and from research. It’s a forecast, not a guess. It’s hard to forecast, sure, but it’s even harder to run a business well without a forecast. If you are forecasting sales of an actual physical product going through retail stores, then you should take into account reasonable expectations for distributors, retail chain stores, number of stores carrying it over time, unit sales per store, etc. You’d want to have a good understanding of how margins work as you sell your product to distributors and they sell to retail stores. You should be able to estimate the related expenses, such as stocking fees, co-promotion fees and administration costs. If you are forecasting sales of a mobile app, you’d want to look at sales through each of the mobile-app stores and develop assumptions based on the history of similar apps, adjusted for your promotion strategies, marketing expenses, etc. If you are forecasting sales with a direct sales organization selling to larger companies, you should understand a direct sales force, reasonable expectations of leads, presentations and closes per month per sales person, pipeline dynamics related to decision time, etc. These are just a few examples. Yes, it is guessing, but it’s also looking at drivers and assumptions and pulling the granular assumptions together so they are visible. Forecasts get steadily more accurate over time. It's not just useful, it's vital. Managing the interaction between sales, costs and expenses is absolutely essential to keeping a business healthy. You can't manage it without having forecasts as budgets, and watching performance, month by month, to catch the changes between the forecast and the actual numbers. If sales are above the forecast, then you can spend more on marketing and grow faster. You have clues to what's working. If sales are below the forecast, then you know you need to look at expenses too to cut them in proportion. Startups need to develop reasonable forecasts for how much money it takes to get to cash flow to break even. You can't do that without looking at realistic assumptions for sales as the ramp up, costs related to sales and expenses. Bootstrappers need to manage forecasts very carefully, because they can't overspend budgets. 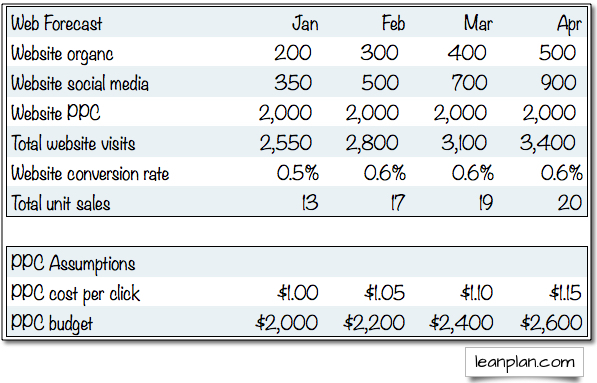 Monthly plan vs. actual analysis is the key to keeping money in the bank. Startups looking for funds need to convince investors that their sales forecasts are credible and that their expense forecasts are also realistic. Of course, it all boils down to cash flow. Forecasting is vital to managing cash flow.